Gary David has spent the last 30 years immersed in Native American culture and history. From the Black Hills of South Dakota to the desert of Arizona , David has sought after the mystical connection between patterns in the heavens and the cosmic arrangement of things on Earth that reflects the order handed down by the gods of antiquity. David has produced two books dealing with his research into, among other things, the Hopi tribe of Arizona : “The Orion Zone: Ancient Star Cities of the American Southwest” and its sequel “Eye of the Phoenix : Mysterious Visions and Secrets of the American Southwest.” Both books cover different aspects of the many anomalies of the region. The fascination with Native American culture began for David when he taught English at the Pine Ridge Reservation in South Dakota and witnessed some of the indigenous ceremonies. “Sacred ceremonies,” David said, “like the Sun Dance. I did some Sweat Lodges and the Sacred Pipe Ceremony. And I met a woman named Charlotte Black Elk, and she was talking about the idea that the Earth reflects the stars. As above, so below, that hermetic maxim. For instance, the Black Hills are kind of the center of Lakota culture, and it’s represented in the sky by a celestial buffalo. The buffalo is made up of various constellations. David made a trip down into the Southwest in 1987, visiting various ruin sites and other ancient Hopi sites and began to take an interest in their culture, which he is says is much different from the Lakota up north. David’s fascination with the Hopis led him to move there in 1994, and he has been studying the culture and attending various ceremonies ever since. His inspiration for his first book, “The Orion Zone,” came to him when he was watching a Hopi Kachina dance. The reader is perhaps familiar with the well-known Kachina dolls, but the term also applies to the native custom of wearing a Kachina mask as well as to the dancers impersonating a Kachina as part of the ritual. David said that Kachinas are considered to be a kind of intermediary between the realm of humans and the realm of the gods. When attending one of the Kachina dances on the Hopi reservation, having just read a book called “The Orion Mystery” by Robert Bauval and Adrian Gilbert, which theorized that the pyramids of Giza were patterned after the Belt of Orion, David said he looked up at the three primary mesas on which the Hopi have settled in northern Arizona and was struck by the thought that something similar may have happened there. For ten years, David traveled to the various sites on his map matching the Orion pattern and began to study the local rock art as well. Needless to say, he found further correlations, including indigenous star charts and depictions of various celestial creatures. The more recent of David’s books, “Eye of the Phoenix ,” gets its title from the familiar myth of the great bird rising from its own ashes. The Hopi belief is that the world has gone through many different cycles, and they say that we are presently at the end of the Fourth World . David next made a connection between Egypt and Arizona and the naming of the city of Phoenix itself. There is still a further interesting link. The phenomenon of culture and mythology tying the Hopis to the Egyptians, separated by millennia and thousands of miles is at least partially explained by a theory of history called “diffusionism,” which simply means that ancient man may have traveled much more widely than he is given credit for. The opposite school of thought is called “isolationism,” meaning that once the native people crossed the Bering Straits, they remained isolated on this continent until the arrival of Columbus , or at least until the Vikings came along in 1000 A.D.
David points to some rock art near Sedona , Arizona , as one piece of evidence for this idea. The natives there carved out a symbol for their water clan virtually identical to the ancient Hindu symbol for OM , the mystical sound of the universe that is part of meditation rituals throughout the world. But even beyond the serpentine Nagas, there is the extraterrestrial presence to consider, according to David. There is also a linguistic link with the Anunnaki of ancient Sumeria, thought by revered scholar Zachariah Sitchin and others to be the alien race that came down from the sky to teach man the ways of civilization. The friendly Ant People seem to have left the Hopis to their own devices when the time came for the Third World to be destroyed in a terrible flood. In that disaster, the Hopis survived by going across the ocean on bamboo rafts to arrive in our present Fourth World and the Ant People dropped out of the story. But other helpers soon came along. According to the story related by David, a great flood was about to engulf a Hopi village and the people were fleeing the coming destruction. There was a little boy and girl, twins, who were somehow left behind. They decided to try to find their parents and escape the flood. “So they went out across the desert,” David recounted, “and during the first night they were camping. They saw what is called a ‘flying shield’ come down right before them. This being, this sky creature, got out of this flying shield. It was described in the legend as having some kind of clothing or costume that glittered like icicles, and the face shone like a star. That’s the way they describe the face. The sky creature located the twins’ parents and delivered the children to them, after which the flying shield took off again. David explained that flying shields are a frequent motif of the Hopi, and there is again a linguistic connection. Along with Sotuknang, the benevolent Kachinas, the spirit messengers, also pilot the flying shields-type craft. There is yet another Hopis god with extraterrestrial overtones, named Masau’u. “Masau’u was there at the beginning of the Fourth World . He’s the god of the Earth and the underworld and fire. This god led the people around and determined where they should build their villages. The people were basically migrating across the desert and building stone pueblos. They would live in these pueblos for maybe a century or less, and then they would abandon things and move on to another place. And the god Masau’u was with them all along in their journey. 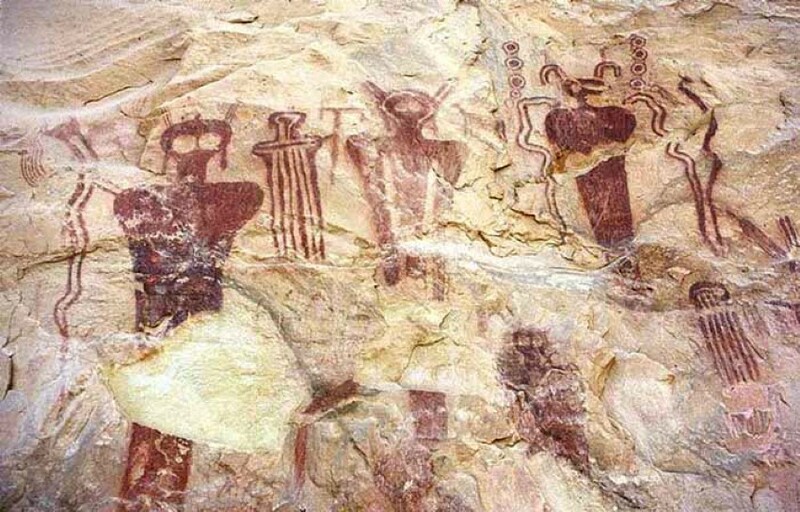 That’s where I believe this pattern of Orion on the desert of Arizona was fixed, by their migrations and the instructions of the Hopi god about where to build these villages. “But Masau’u is a strange looking creature,” David continued. “He has a bulbous head and very large round eyes and a large round mouth. And he’s kind of bald. It’s said that his skin resembles the texture of a summer squash, kind of bumpy like that. His feet are very long and his body is always described as being gray. In fact, the word ‘amaus,’ the root word of Masau’u, literally means in the Hopi language gray. There are connections with the underworld and death and this kind of subterranean world that Masau’u is supposed to inhabit. The Hopis also have a long legacy of prophecy, including dire predictions of the End Times. The prophecies reached the world at large through what is called the “Hopi Hearings,” held in July of 1955. “It’s funny,” David continued, “that the Hopis are probably the least Christianized of any of the tribes in the Southwest. Some of the tribes along the Rio Grande were more affected by the Catholic Church and their bringing missionaries to the area and building mission churches. But on the other hand, the Hopis have what I call a legacy of prophecy that resembles a lot of Biblical prophecy. A lot of people are interested in End Times prophecy, and the Hopi have been foreseeing the future for perhaps over a thousand years. They’ve foreseen what’s going to happen. Meanwhile, the Hopis are themselves a very isolated culture, with some people on the reservation still living without electricity and with a single well serving the water needs of the entire village. The Hopis may have foretold the coming of the women’s liberation movement when they prophesied that women will start to wear men’s clothing. The Hopi also prophesied that they would journey to the “House of Mica” to plead for peace and would be ignored. The passing away of the Fourth World and the coming of the Fifth will be a difficult time for mankind. “The Hopi are a very humble people in that they perform their ceremonies to keep the world in balance. But they think that slowly the axis of the world is becoming unstable, and unfortunately a lot of the ceremonies are no longer being performed in the same spirit that they used to. Because of the modern assault on Hopi culture, the traditional culture—and this is true for all Native-American cultures—a lot of the ceremonies are dropping away. The Hopi have foretold that the ceremonial cycle will end and this will be at the very End Times. There will also come a “Purifier,” named Pahana.